A.K.A., last week’s haul, desperately late. I thumbed through Marvel’s The Siege in the store and decided – as I do for nearly every Marvel event comic – to skip it. Chad Nevitt at Comics Should Be Good sums it up pretty well: The “Dark Avengers” (villains acting as the Avengers since the real Avengers have been ousted by the powers that be) attack Thor and Asgard. My fundamental problem with Marvel’s events – and the way their comics have gone generally in recent years – is that the heroes aren’t very heroic. J. Michael Straczynski’s Thor was bland and dull, and having a bunch of villains attack a group of gods who really aren’t very heroic themselves is just not interesting to me. Sure, I like Thor a lot better than I like the villains, so I’d prefer him to “win”, but I don’t care enough to get engaged with the story. Part of DC’s Blackest Night event involves resurrecting some cancelled comics series of years past for one more issue. One of the more unusual comics of the late 80s/early 90s was John Ostrander’s Suicide Squad, which Gail Simone’s Secret Six bears some resemblance to: The Squad were villains who were recruited for high-risk government-sanctioned missions, with the promise of a pardon afterwards. The Six are a small organization of criminals. The Six are sort of the darker version of the Squad. So in this one-issue revival of Suicide Squad, there’s a little of the usual rigamarole regarding dead Squad members being revived as black lanterns, but mainly it’s about Amanda Waller of the Squad deciding she needs Deadshot for a mission, and staging a trap for the Six to both put them out of business and capture Deadshot to force him to rejoin. 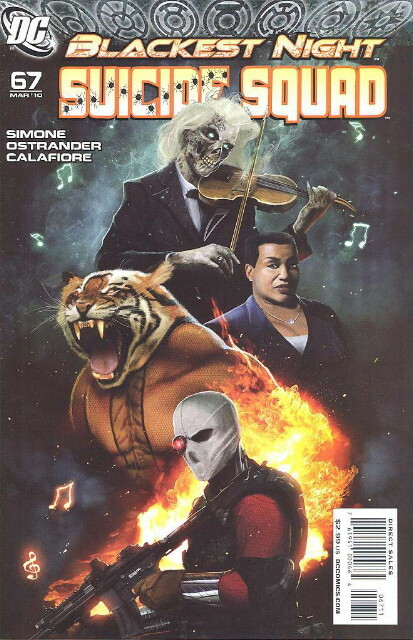 It’s a good set-up for the next Secret Six story arc, and Ostrander and Simone co-write it. It ought to be good, as long as the black lanterns don’t play too big a role. Rick Remender and Eric Nguyen’s Gigantic comes to an end, the last issue being extremely late (issue #4 came out last May), and unfortunately it wasn’t worth the wait. 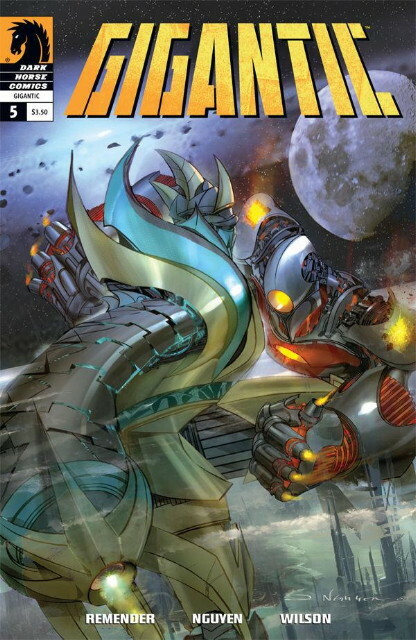 The trappings are those of big monsters smashing each other, but the story itself is rather depressing, and the upbeat ending in this issue not only doesn’t really put a brave face on the earlier events, but it feels very out-of-place next to the rest of the story. Greg Burgas found it disappointing, too, and he touches on some of the series’ other flaws: The lead character is unsympathetic, the story is hard to follow despite not being very complicated. Nguyen’s art doesn’t work for me at all: It’s too sketchy, which doesn’t do justice to the designs of the characters. I didn’t care for it in Sandman Mystery Theatre a few years ago, either. For a similar premise – a young man leaves with aliens, and comes back years later to find he can’t go home again – I’d recommend Dan Vado’s graphic novel The Griffin instead. It has its flaws too, but the story is far more satisfying than Gigantic.